An unusual and 'confusing' grave site dug up in Romania by a student from The Australian National University (ANU) is helping provide evidence for the first official written history of the Székely people. 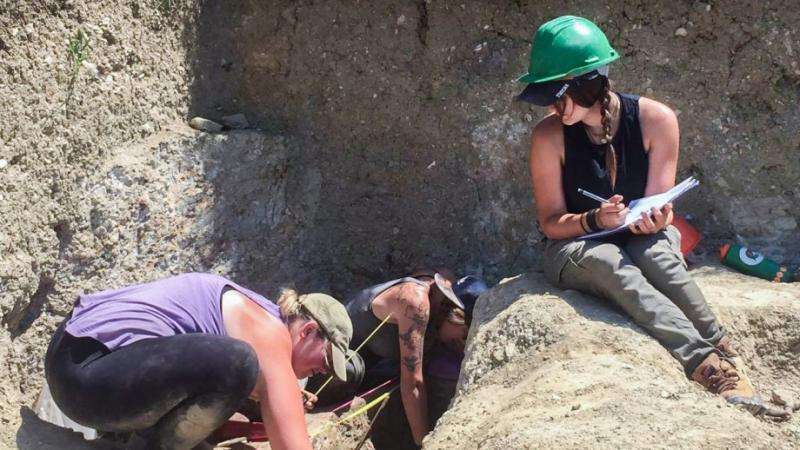 Coco James, a Master of Biological Anthropology student with the ANU School of Archaeology and Anthropology, has returned from a field trip in central Romania where she unearthed a grave burial in a Transylvanian cemetery. Ms James said the team excavated a total of 49 graves at the site dating from the 17th to 19th century, but it was Grave 42, the one she excavated with two other students that proved to be the most unusual. "He had a lot more items in the grave than any other burial on the site. Coins, brass buttons, ceramic buttons, and a leather liner," Ms James said. "The skeleton had five enormous coins in its hands, whereas most of the burials had one or maybe two very small coins. "He was very healthy, he had no indicators of disease. He had some trauma, he was around 27-35 which is quite consistent with a lot of the other skeletons on the site. "Most likely it was a wealthy individual with good standing in his community." While the number of items made the grave interesting, it was the alignment of the skeleton that had the team of archaeologists scratching their heads. "He was buried almost upside down, rolled onto his side and tilting downwards. "In the end we decided the most likely situation is that during the burial they lost their grip on the coffin and it rolled and fell in upside down, they looked down and said, 'You know what, no one's ever going to know'," she said. Ms James said the project will have a significant impact on the local Székely people, who live in a small series of Romanian villages but retain a Hungarian culture. "They were originally located in Hungary and migrated to Transylvania in the 11th or 12th century. They have held onto their heritage and their land in the Székelyföld since then. "They don't really consider themselves Hungarian or Romanian. "There are no written histories for the Szekely people of this area, just oral histories. Only now is there a project to develop a written history, so being able to do this work and provide physical evidence is incredibly important. "It gives the people that are going to write these histories lot of fuel to use." Ms James' took part in the field trip as part of a project run by ArchaeoTek, an organisation dedicated to providing research opportunities in Romania for archaeology and anthropology students. Ms James will present her work at the American Association of Physical Anthropologists Conference in April. So much Science All The Time; Even from Graves! Why People Lose Entanglement As They Age, is Quite Evident! I'm still puzzled what that skeleton is so puzzling about.